A suspected big cat poacher has been eaten by lions near the Kruger National Park in South Africa, police say. The animals left little behind, but some body parts were found over the weekend at a game park near Hoedspruit. "It seems the victim was poaching in the game park when he was attacked and killed by lions," Limpopo police spokesman Moatshe Ngoepe told AFP. "They ate his body, nearly all of it, and just left his head and some remains." Police have not yet established the victim's identity. A loaded hunting rifle and ammunition were found next to the body, South African website Eyewitness News reports. 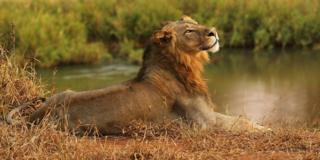 Lion poaching has been on the rise in Limpopo province in recent years. When is hunting not poaching? The big cats' body parts are sometimes used in traditional medicine, both within Africa and beyond. Wildlife charity the Born Free Foundation says lion bones and other body parts are increasingly sought-after in South East Asia, where they are sometimes used as a substitute for tiger bones. In January 2017, three male lions were found poisoned in Limpopo with their paws and heads cut off. Video Are people hunting 'canned lions' in South Africa? When is it hunting and when is it poaching?